Tag Archive | "Lemon Cichlid (Neolamprologus leleupi)"
The Lemon Cichlid (Neolamprologus leleupi) also known by tropical fish keeping enthusiasts as the Lelupi, Orange Lelupi Cichlid, Orange Neolamprologus Leleupi Cichlid, Gold Cichlid, Gold Leleupi Cichlid, and Tanganyikan Lemon Cichlid. It originates from the rocky coastal waters of Lake Tanganyika, Africa where it occurs throughout the lake. The Lemon Cichlid is a “recess dweller” that makes its home in the cracks, caves, and crevices of the rocky coastal areas where it primarily feeds on invertebrates that live in the biocover of the substrate. 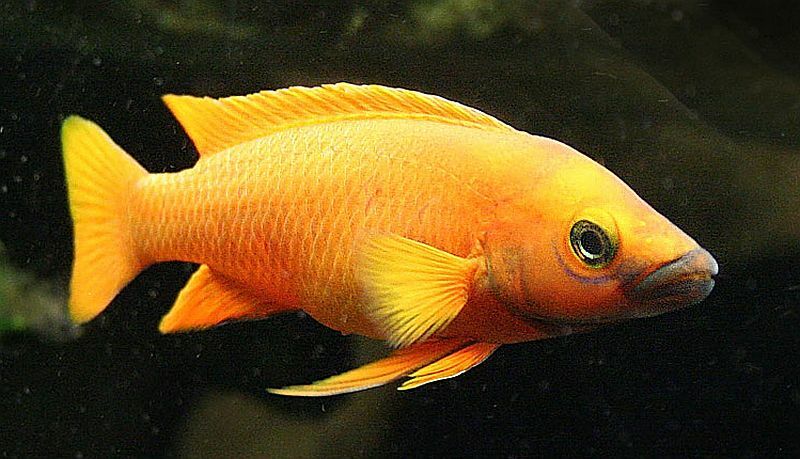 Depending on what area of the lake the fish is collected from, the Lemon Cichlid varies in color from a bright yellow, to a deep orange brown, to a red. It has an elongated body and a surprisingly large mouth for its size that is outlined in black or blue. Captive bred specimens are often called descriptive names like Dutch Orange, Firecracker, and Super Bright Orange. Lemon Cichlids are relatively aggressive towards their own kind and other fish that invade their territory. In an aquarium environment, they need lots of rock formations in their tank to make them feel secure. The Lemon Cichlid (Neolamprologus leleupi) can be housed with other smaller Tanganyikan cichlids in a tank that is at least 30 gallons, but a larger tank is highly recommended. Aquascape the tank with a sandy bottom of white aragonite to maintain the pH and alkalinity of the water, and load the tank up with plenty of rocks, shells, and pieces of African Driftwood so the fish can build caves. A white aggregate is recommended to maintain the bright yellow or orange colors of the fish. A darker substrate will cause the fish’s colors to substantially darken. The tank water must be kept free from Ammonia and nitrites so regular partial water changes are mandatory. Keeping the water parameters to those found in Lake Tanganyika will keep these fish healthy and free from disease. The Lemon Cichlid is a secretive cave spawner and although breeding is reported to be more difficult than most of the cichlids, when given enough hiding spaces and crevices to hide among, a pair will easily spawn. Neolamprologus leleupi are a very slow growing species and may take a few years to reach sexual maturity, but the easiest way to develop a breeding pair is to place at least 6 juveniles in a tank to see if any fish pair off. At sexual maturity, the males are typically larger than the females and are about 4″ in length compared to 3 1/2″ for the females. If a sufficient number of caves and crevices are provided in the tank, a pair will choose an acceptable breeding site and start defending their territory until the female lays anywhere from 100 to 150 eggs within the cave, usually on the ceiling or along the walls. After the male fertilizes the eggs, incubation will occur in about 3 to 4 days. The fry becoming free swimming in about 8-10 days. During the initial period of brood care, the fry will remain in the cave with both parents alternating in protecting them. Once the fry begin to leave the cave you may want to remove the parents. Lemon Cichlids are very good caregivers and will provide parental care until they are ready to spawn again but when the fry reach about 1″ in length, the parents may turn on them. Water quality in the tank is essential as the young are very sensitive to accumulations of bacteria and organic wastes. 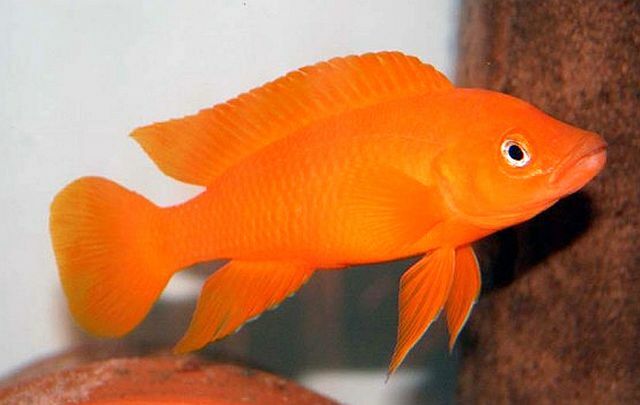 Feeding Lemon Cichlids is a matter of providing a diet of mysis shrimp and other live foods high in carotene to help promote their luminous yellow/orange coloring. Live or frozen bloodworms, brine shrimp and mysis shrimp, carnivore flakes and pellet foods are all eagerly accepted. When available for purchase, Lemon Cichlids are usually 1″ to 1-1/2″ in length.